Old Bollywood movie poster of the hit romantic Hindi film, Dil Apna Aur Preet Parai (1960) for sale. This is an actual surviving original vintage Bollywood movie poster of the 1960 Hindi film that featured Raaj Kumar and the Tragedy Queen of Bollywood, Meena Kumari in lead roles. Dil Apna Aur Preet Parai’s music composed by the legendary duo Shankar Jaikishan became a rage throughout the nation. Tracks from the film (most notably “Ajeeb Dastan Hai Yeh” sung by Lata Mangeshkar) are fondly remembered and played till today. Printed and circulated during the original first release run of the film (late 1950s / early 1960s), this old hand painted Bollywood movie poster was originally designed for publicity of the film but never ended up being used. 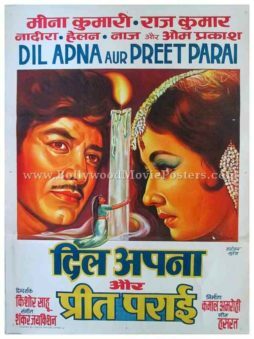 This old Bollywood movie poster was originally hand painted on canvas by a leading Bollywood poster design studio in Bombay. Beautiful hand painted portraits of Raaj Kumar and Meena Kumari appear side by side divided by a large burning candle in the center. A woman appears to be holding on to the base of the candle. The lead actors as well as the supporting cast are mentioned prominently on the top. The printed signature of Bollywood poster painter Manohar Suresh is seen on the bottom right. This vintage Bollywood poster has been graded ★ As Is due to a few tiny holes as seen in the photograph (below Meena Kumari’s face). Overall fair condition and these minor imperfections make no significant difference to the display quality of the poster from a viewing distance.